The United States is home to the largest apparel market in the world, according to Statista. In 2016, store-based retail was valued at approximately $292 billion US dollars and is projected to reach $390 billion by 2025. Women’s apparel and girls’ apparel hit $117 billion in the United States in 2017, according to Statista, while the market for men’s and boys’ apparel was roughly $87 billion. The US apparel market is notoriously frenetic, with brands, retailers, and marketers all trying to adapt to or drive consumer trends or create a shopping experience that will attract and retain customers. If you’re one of the many US designers or clothing manufacturers looking to kick-start a fashion line, it’s important to pay attention to market trends and top-selling products, including popular fabrics and designs. A few clothing items made a first-time appearance on the list as well, such as men’s casual jackets, flower girl dresses, women’s jumpsuits, and cocktail dresses, as well as breathable, waterproof fabrics. New products can add insights into consumer spending habits and emerging trends and can be a valuable source of information to new designers. Given the competitive nature of the fashion industry, designers should heed these trends when creating a new line and select the best US clothing manufacturers. While keeping tabs on emerging trends can aid in the development of a top-selling fashion line, fashion designers have the added challenge of designing and developing, manufacturing, and marketing their line on time and under budget. Traditionally, designers develop their own specifications, source and test materials, coordinate with domestic or foreign manufacturers, test samples, and revise product designs, either solo or with several contracted vendors. This process can be effective, but invariably takes a lot of time and resources. There is a new model emerging in the fashion industry, however, that offers one-stop consolidated services across design and development, manufacturing, and marketing sales. Under this full-service approach to clothing manufacturing, experts with experience help entrepreneur designers from the design phase all the way through marketing sales. To start, developers work with you to create a budget, identify and test materials, and develop samples. Then, still working with the same company, you’ll transition into manufacturing and actually see your idea become a product. This stage includes everything from marking, grading, and cutting to sewing and finalizing fine details. Finally, after design and manufacturing, this new model helps you market your ideas and create a professional, online presence. Whether you need look books, graphic designs, or a social media campaign, you will have the support of in-house experts who have seen your fashion line from inception to completion. Whether you’re ready to kick-start your new fashion line based on emerging product trends or you’re looking to utilize popular fabrics to gain traction in the market, make sure solidify your advantage in this ultra-competitive industry by ensuring that you have a good manufacturing strategy underpinning your quality design ideas. It’s hard to overstate how complex starting a clothing line can be. In addition to the requisite funds needed, new fashion entrepreneurs should be prepared to enlist the support of designers, sourcing specialists, and clothing manufacturers to make their clothing concept become a reality. This traditional model requires a painstaking amount of time coordinating with different contacts and specialists, sourcing and testing materials, and waiting to receive and review samples and prototypes. At best, designers are left working long, tireless hours to get their creative designs finished on time. At worst, a nascent brand becomes bogged down by delays, do-overs, and cost overruns. The good news is that a new apparel manufacturing model is looking to up-end this old process through a more personalized in-house approach. Brands like Indie Source are replacing dusty warehouses and distributed communication with clean, collaborative spaces and a team of project managers, sourcing specialists, pattern makers, and sample makers under one roof. But what exactly does this new model look like? The new approach to clothing manufacturing offers in-house expertise and consultancy services focusing on design, development, sourcing, manufacturing, printing, and marketing. A full-service model offers a team of product designers to help with every stage of development. This includes project planning, sourcing materials, pattern making, sample making, and revisions. The design stage can often be the most complex, particularly if you don’t have a strong background in fashion design or merchandising. Instead of navigating these complexities on your own, a full-service model will help you establish all the details up front so you can move into production confidently. One key area that is often overlooked is the value of focusing on costs very early on in the process. Fortunately, by working with experts with experience in taking numerous brands from start to finish, you can sidestep some of the issues many face in trying to get their clothing line to market. In fact, part of Indie Source’s initial kickoff meeting with clients is to help them identify their target manufacturing costs. From there every other step is carried out with a clear budget and target in mind. Development is done with a goal to hit costs. Fabric is sourced accordingly and the quantity produced is modified as needed in order to hit these targets. Keep in mind each brand will have different priorities when starting. For some, ordering low volume to start prevents risk in case their items do not sell. For others, they are looking to scale and are able to do more units and lower their per unit price. This financial planning is something that other shops do not offer—it’s very aligned with Indie Source’s mission to create successful fashion brands. Once your samples are ready, you typically start reaching out to either foreign or US clothing manufacturers to produce the clothing to specified standards and quantities. This often requires vetting manufacturers using an agent or word of mouth to ensure they meet your quality and labor standards as well as delivery needs. 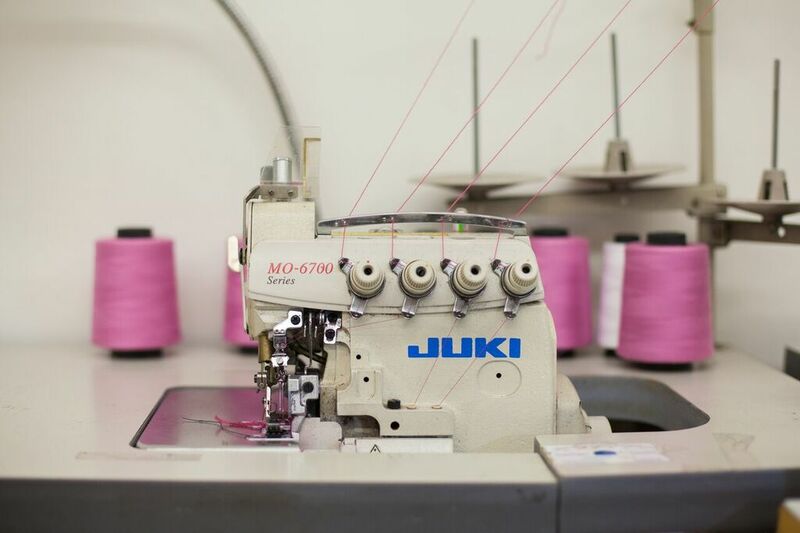 Nothing can unravel a new clothing line faster than poor quality and production delays, so building a relationship with your clothing manufacturer is crucial. Typically, the onus is on the new clothing developer to coordinate things like service contracts, pricing agreements, production lead times, terms and conditions, etc. It can be done, but it requires a lot of time. A full-service model simplifies this process by manufacturing your order on-site. Since designers, developers, and producers are on-site, they can transition your designs seamlessly to the manufacturing phase and reduce delays and errors. Domestic manufacturers also often have access to a large network of mills, converters, and importers, which can streamline the manufacturing process. The full-service approach to clothing manufacturing walks you through every phase of production, including the important step of branding your unique designs. In conjunction with the in-house designers, this new approach will help you build a professional website to capture your finished samples with high-grade branding, logos, labels, and look books. In addition to these key assets, Indie Source has selected some of the best marketers in the industry to support new brands with their launch and growth. Indie Source is taking the guesswork out of launching a new label by consolidating experts in-house to walk you through each complexity and uncertainty. This personalized approach to fashion design is helping to remove the frenetic uncertainties associated with quality control, foreign manufacturing, and product development by bringing a team of experts straight to you. Based in Los Angeles’ fashion district, Indie Source is a full-service clothing development and marketing firm that is changing the way apparel comes to market. With in-house experts across the development, production, digital design, and consultation phases, Indie Source can help bring your vision to life. The innovative company is among the top clothing manufacturers in the USA. We’ve all heard the warnings about startups: 8 out of 10 new businesses fail within the first 18 months; don’t expect to make a profit for at least the first two or three years; American fashion brands and retailers are on the decline, etc. However, like most statistics, the devil is in the details, and this case, the details offer a more promising outlook. According to the Small Business Administration, about 75% of new businesses survive at least the first two years, and roughly 50% survive at least the first five years. This five-year survival rate has been on an upward trend too. In 2016, for example, nearly 49% of companies hit the five-year mark, an increase of 3% from 2015, according to the Kauffman Foundation. This is good news for the fashion industry, which has certainly seen its share of ups and downs. So, what makes some new clothing lines succeed and others become a statistic? In many cases, it comes down to how well a new entrepreneur can navigate the three key stages of product production and bring an innovative product to market. The design and development phase is one of the most important stages of a new fashion line. It’s the time to create a value proposition, differentiate your product in an ultra-competitive market, develop a concept for your collection, and determine the specifications that describe your collection. Under the umbrella of design and development, sourcing covers every aspect of an article of clothing, including material, trims, buttons, zippers, elastic, etc. You can source the material through an agent, online, a trade show, or a full-service development shop. Once you source the materials, you should complete a few samples and prototypes that you can then hand off to clothing manufacturers to use as a reference. In many ways, this is where your vision comes to life. Using your sample and prototype, a manufacturer will produce your designs to the specifications you provide. You have two options when it comes to production: a domestic manufacturer or a foreign producer. US clothing manufacturers tend to adhere to stricter labor and environmental standards, which can be an asset not only for your overall brand identity but also if your line requires specialized materials or a specific deadline. Foreign manufacturers will likely have cheaper labor costs, but often require high minimum orders and high tariffs that can add up to costing as much as US prices. You will likely have to draw on different professionals to complete each of these key phases. Failing to do so could result in delays, cost overruns, or quality control issues. In addition to designing and manufacturing your clothing line, you’ll also have to market it in order to make sales and build buzz for your brand. You’ll need a professional website that showcases your product line in a clear and enticing way with high-quality photos. There will also be branding, logos, and labels to decide upon and produce, in addition to a high-quality look book or catalogue to display your products. A strong social media presence and strategy can help drum up interest in your product, in addition to compelling ads. There is another option, however. And that’s the in-house approach. Indie Source consolidates design, sourcing, and manufacturing expertise under one roof, alleviating the time and stress of finding professionals in each field. Indie Source offers apparel manufacturing and consultancy services that cover every aspect of launching a clothing line. You can access product development, manufacturing, and creative marketing experts who will help bring your vision to life and help you navigate the complexities of the fashion industry. They’ll even help you market your finished product.